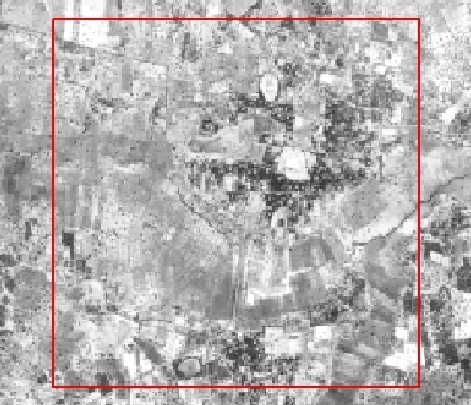 Classification of remotely gathered data, either satellite imagery or aerial photographs, is the foundation for a host of the major spatial analysis components in the Nang Rong Project. 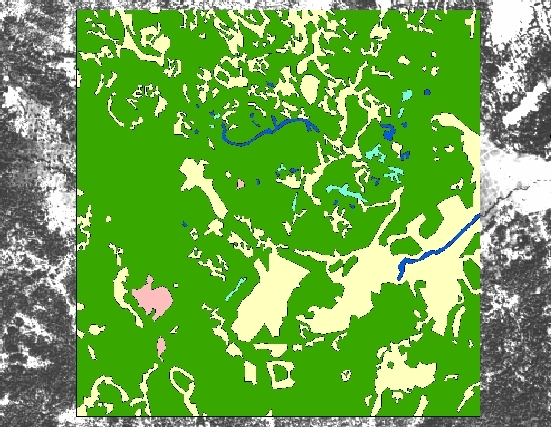 While raw satellite imagery and aerial photography afford the viewer a useful historical overview of the region, the generation of LULC classifications allows for the quantification and tracking of landscape changes through time. Using a variety of supervised and unsupervised methodologies, the Nang Rong Project has generated a robust time series of classified images. Moreover, in order to faithfully and accurately characterize the landscape, both the land use and land cover classes were carefully researched and selected, and, finally, tested for accuracy. 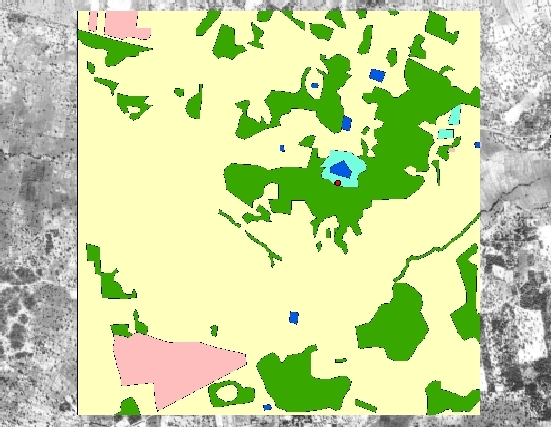 Following the generation of Land Use and Land Cover classifications for the catalog of images, a number of analyses are enabled. LULC history is of vital importance in understanding and explaining the complex history of Nang Rong. This is achieved in a variety of ways. Calculation of the areas of various LULC classes on a per year basis paints a picture about the broad changes in the region. Similarly, the structure and composition of the landscape is performed through the use of pattern metrics, which helps in understanding the ways that human development is fundamentally altering and shaping both the make-up and configuration of LULC in Nang Rong. Another important analysis arising following LULC classification is the change detection. In performing change detections, the "From-To" (the beginning and ending image in a time series) LULC values are tracked at a variety of time steps: intra-annual, inter-annual, decadal, as well as any other temporal intervals that are of interest to the researchers. A related means of tracking the dynamics of Nang Rong is through pixel history and trajectory work, whereby the classifications are analyzed at the pixel level in order to see how change is manifested at the micro level. Cellular automata (CA) modeling, whereby the evolution of the landscape is predicted from the generation of rules of growth, is another avenue of research that is facilitated through the time series of classifications. LULC classifications are also effectively coupled with the rich social survey datasets in order to examine the determinants of LULC, as well as to investigate the correspondence between the survey data and the classifications. The classification of aerial photographs is also an invaluable process in the generation of information. While satellite classifications have tended to take place at the regional level, air photo classification for the Nang Rong Project has focused instead on smaller intensive study areas. This divergence in classification approaches is mostly an artifact of the highly intensive, manual interpretation that is required for the classification of photos. In the processing of satellite imagery, on the other hand, it is no more difficult to process entire scenes as it is to process a small area of interest. Another major difference between air photos and satellite images in the approach to classification results from the nature of the data. Since air photos lack spectral information, their classification is based on the texture, pattern, lightness/darkness, and context of the features on the photos. 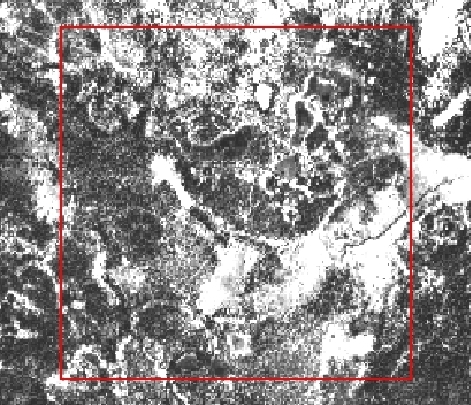 As such, none of the higher level image processing that is utilized in the classification of satellite images is applied to air photo classification. Since the air photos have a richer temporal depth, the analyses that stem from the classifications help to more accurately characterize the development and LULC history of Nang Rong. Calculations of LULC areas are made at decadal intervals, helping to chart the evolution of the region. Likewise, pattern metrics aid in understanding the fundamental changes in LULC structure and composition that are occuring on the landscape.